When squatting in residential buildings was recently criminalized in England and Wales, the debate raged primarily around the issue of homelessness. Right-wing politicians implausibly claimed there was no connection at all between squatters and the homeless, while supporters of squatting warned that putting people in prison for occupying derelict property was a retrograde step which would probably have tragic consequences. When a homeless man froze to death outside an empty bungalow after being told by the police not to enter it, the warnings were sadly proved correct. Yet within this debate, which featured simplified and polarized views, the many positive aspects of squatting as a social movement were drowned out or ignored. Since the late 1960s, as in previous times, squatting has enabled diverse groups to house themselves. It has also supplied the opportunity structure for many different projects to come to life. The bungalow outside of which Daniel Gauntlett died. This article describes only a few examples from this hidden history of resistance. There are many other stories that we do not have space to explore—the thriving rave scene that produces temporary autonomous zones on a weekly basis across the country, travelers finding freedom on the road, community-based activism such as Occupy or free schooling, squatted homeless shelters, and more. Still others remain unwritten and unrecorded. We hope to see more of these stories enter circulation. When soldiers returned home after World War II, the English housing stock was in a complete shambles; no new houses had been built for six years and some areas were bombed out. Just as the Government had promised “Homes for Heroes” in the 1920s but failed to deliver them in sufficient numbers, the political rhetoric did not match the reality. All over the UK, people began to squat. In Brighton, the Vigilantes cracked houses for families. Also known as the Secret Committee of Ex-Servicemen, they featured the redoubtable Harry Cowley, whose name lives on in the present day Cowley Club, an anarchist social centre. The idea spread like wildfire to other cities. Without any central command, people were taking direct action to house themselves. Many army camps slated for demolition were repurposed into temporary housing; people lived in some of these well into the 1950s. These Nissen huts were hard to heat and not always in great condition, but over time they were adapted into homes to be proud of. At first, the government was critical of this independent enterprise—saying it could only lead to anarchy—but came to recognise that it was powerless in the face of such a large-scale movement, which by 1946 numbered 45,000 people in over a thousand locations. Later, people organized the protest occupation of large buildings in central London such as the Ivanhoe Hotel. After first condemning the squat actions and advising people to wait to be housed by the state, the Communist Party eventually became involved; the fact that a few party members were arrested for organizing the London actions sometimes misleads commentators into thinking that the Communist Party was itself behind the entire movement. While certain occupied camps benefited from the involvement of local communists, this should not be understood as a party political issue. There was widespread support for the squatters across the political spectrum, since they were taking action to house themselves in an extreme situation. The right to housing is still far from being met today. The last thirty years have seen a sustained attack on social housing, which the present coalition government has continued, despite pre-election promises. In Tower Hamlets in the 1970s, male Bangladeshi immigrants found it hard to get access to Council housing. They were caught in a catch-22: single men were not given housing unless they had a family, but they could not bring their families to London unless they provided proof of accommodation. Yet there were derelict Council-owned properties everywhere. A squatting movement sprang up in the East End, through which hundreds of families were housed in areas such as Whitechapel and Bethnal Green. Terry Fitzpatrick, an anti-racist organizer, set up the Tower Hamlets Squatters Union and worked alongside Race Today, a black radical group which published a monthly magazine and included the Black Panthers Darcus Howe and Linton Kwesi Johnson as members. In a 2006 interview, Fitzpatrick recalls that the Bengali Housing Action Group (BHAG) was formed in 1976 and Pelham House was squatted soon after. There were 60 flats, with seven or eight remaining tenants. The owner, the Greater London Council (GLC), had marked it for demolition—but by the end of 1976 there were 300 Bangladeshis in occupation. The area around Fieldgate Mansions; photograph by David Hoffman. There were perhaps 1000 people altogether living in East End squats connected through BHAG. Fitzpatrick says “We never lost a single squat, between 1974 and 1979 or 1980, when it came to a sort of end.” The end was a success rather than a defeat: the GLC caved in to the demands of the squatters and rehoused them locally, exactly where they asked to be placed. This was important only because the squatters got what they wanted, but also since their activism was in part a response to the racist activities of the National Front, which regularly attacked immigrant families rehoused to areas further out in the borough, such as Poplar. Sadly, clustering together was not always enough. On May 4, 1978, Altab Ali was stabbed and murdered by three skinhead youths as he walked home past St. Mary’s Park in Whitechapel. The park was renamed in his memory. Demonstration in memory of Altab Ali. Fitzpatrick concludes that “It was 1974-80 that shaped the community the way it is today, without a shadow of a doubt. Had that [the squatting movement] not happened, I don’t know what would have happened. Something would, but it might just have come later.” The area around Brick Lane, for example, would look and feel very different today. According to historian Sarah Glynn, “The housing struggle not only improved living conditions and left the Bengali community unique among ethnic minority groups in the proportion living in council housing; it also helped to involve a great many people in local activism and politics.” She also observes that the Jewish Communist Party had led a campaign in the late 1930s for a previous wave of immigrants in the same area where Bengali immigrants struggled for decent housing in the 1970s. Glynn points out what could be taken as a central contradiction, namely that it was the white Fitzpatrick and the black activists of Race Today who were squatting on behalf of Bangladeshi families. Fitzpatrick was squatting alongside the families and learned to speak fluent Sylheti, but this remains a contentious issue. Whilst some participants in BHAG were critical of the reasons for Race Today to be involved, seeing the group as pushing its own agenda, others welcomed their help; over time, more Bengalis became directly involved in the actions. Glynn politely calls this a “possible trap for those arguing for the self-organization of others” and touches upon a fundamental problem, namely how activists of all sorts can avoid the pitfalls of parachuting into a situation and instead constructively engage with the people already enmeshed in it, people who are expressly asking for assistance. When housing activists want to help diverse groups to house themselves, a great deal hinges on how the help is expressed. Similar issues had cropped up a few years earlier, when Ron Bailey, Tony Mahoney, and the other activists of the London Squatters Campaign kickstarted the modern squatters’ movement through a careful reading of relevant laws and a series of tactical squatting actions that resulted in positive media coverage and councils being persuaded to house squatters. As his 2005 obituary records, Mahoney himself was involved with BHAG in the struggle for decent housing in the East End, squatting in the Fieldgate area and running the Campaign to Clear Hostels and Slums from an office near Brick Lane. Mahoney was also one of the founders of the East London Gay Liberation Front (GLF). The first GLF group in London was formed in 1970; South London GLF members were part of the Brixton Gay Community, which consisted of a series of squats on Railton Road at numbers 153, 155, 159 and on the parallel-running Mayall Road at numbers 146, 148, 150, 152. The houses backed onto each other and the squatters created one huge communal garden. The place was “home for between fifty and sixty men for anything from a week to almost ten years” and in fact, a version of the community still lives on today in the Brixton Housing Co-operative, formed between 1982 and 1984. The extended garden is still there, thanks to squatting. There was also the South London Gay Center at 78 Railton Road, which existed from 1974 until 1976. Two women’s centers were squatted on the same road, along with the People’s News Service, an anarchist bookshop, which had the Gay Switchboard in an office above it. Olive Morris had squatted with her partner Liz Obi at 121 Railton Road, in what is regarded as one of the first occupations of privately-owned property in Lambeth, as opposed to the occupation of council-owned buildings. They resisted several eviction attempts and eventually moved to another squat at 64 Railton Road. The 121 squat became Sabaar Bookshop, a black infoshop and advice center which hosted meetings by the Brixton Black Panthers; Morris and Obi were both members, along with Race Today. In 1981, it appears that Sabaar got funding and moved to Coldharbour Lane. The building became an anarchist social center known as the 121 Center, which existed until 1999. By the late 1990s, the 121 center was running out of steam as Brixton began to gentrify around it—or so it seemed to us when we visited for meetings, although it did host the first Queeruption in 1998, and the monthly Dead by Dawn speedcore parties were great. In the 1980s, it had been extremely active as a café, bookshop, library, venue, and rehearsal space. It was used as a base by groups such as Brixton Squatters Aid, Brixton Hunt Saboteurs, Food not Bombs, Community Resistance Against the Poll Tax, Anarchist Black Cross, the Direct Action Movement, London Socialist Film Co-op, the Kate Sharpley Library, and the Troops Out Movement. There was a printing press in the basement which produced the feminist magazine Bad Attitude, the anarchist magazine Black Flag, and the squatters’ newspaper Crowbar, among other publications. Queeruption in 1998 at the 121 Center. Olive Morris died tragically young, at the age of 27. The Remembering Olive Collective, which organized events and set up a blog to commemorate the thirty year anniversary of her death, emphasized that in the already neglected history of the Brixton squatting scene, there are several references to the 121 Railton Road but very little mention is given to the use of the building first by black activists. Despite living side by side and having cordial relations, Black and White squatters did not organise themselves together. Liz Obi remembers that when they squatted 121 Railton Road, some white squatters came to help them turn on the gas and the electricity. During evictions some women from the “White Women Center” also came to show support, but that was as far as the relationship went. Black activists at the time were focused on the many specific issues affecting the Black community (police violence, discrimination in education and workplace, etc). The absence of joint activity might explain why in most accounts of the Brixton squatting movement written in later years, there are no references to the early Black squats of the 1970s. In the 1970s, some struggles for minority rights did develop along separatist lines, but it seems the tool of squatting was one way for different groups to show solidarity with each other. Veteran anarchist Albert Meltzer remarks in his autobiography I Couldn’t Paint Golden Angels that there was occasional antagonism between Rastafarians and the anarchists on the topics of religion and feminism, but presumably such problems melted away when they faced attacks from a common enemy such as the police or bailiffs. In essence, without squatting we would have remained isolated as gay men living in our individual shabby bedsit or flats or houses. Squatting enabled us to come together collectively to break down that isolation and produced some of the most productive political campaigning and radical theatre, not to mention a shot at non-bourgeois, non-straight ways of living. The Brixton riots broke out in April 1981, when people reacted against the refusal of police to allow medical treatment for a stabbed black youth. It is worth examining the uprising in some detail since it occurred in an area with a lot of squats, centred around Poet’s Corner (comprised of Milton, Shakespeare, Spenser and Chaucer Roads), Railton Road, and Dexter Parade (now demolished). Known as the Frontline, the area seems to have been a sort of autonomous zone, featuring illegal drinking dens, reggae systems, and people hanging out on the streets. It is hard to discover how the Frontline got its name. Was that the name of an off-licence or of a club, or the name residents used to describe the feeling of being there? Courtney Laws of the Brixton Neighbourhood Community Association described the frontline as a place “where people from the Caribbean normally gather, meet, and talk, and very often start up socialising groups and functions. It is very peaceful and quiet.” Chief Superintendent Plowman called it “the front line of confrontation between Black and White.” The gulf between these definitions is huge. In April, tempers were already running high in the midst of Operation Swamp. The Metropolitan Police had sent white undercover officers into central Brixton, an Afro-Caribbean area, to stop and search over 1000 people in just five days. They had done this without any warning to the local community or indeed even to the local bobbies. The Met were widely despised and feared. Some cops were National Front members. Blair Peach had been murdered by a cop at anti-fascist demo in 1979, hit over the head with an iron bar. Despite fourteen witnesses who saw it happen, no cop was ever charged. Documents only recently released—in the inquiry into the murder of Ian Tomlinson at the 2009 G20 protests—indicated one officer was responsible, but his name was redacted. The fascist arson attack which claimed 13 young lives in nearby Deptford in January 1981 had not been investigated by the police; many people, black and white alike, were outraged. In March, 20,000 people had marched to Hyde Park in central London to demand justice. Just as the 2011 London riots began in Tottenham with the police shooting Mark Duggan but different narratives abound as to how the subsequent events unfolded, stories about what happened in 1981 vary widely. Some people thought the police had killed the stabbed youth; others were already at breaking point on account of continual police harassment. Early issues of Crowbar record that already, in 1978, the police had sealed off the Frontline for a day, and that in the months leading up to April 1981, various houses on Railton Road, Effra Parade, and Dexter Parade had been evicted and smashed up by bailiffs so as to render them uninhabitable before demolition. This was presumably part of a plan to drive out the dealers and the music, although it seems that everything always popped back up again. The riot kicked off on Friday, April 10. For the next few days, the area around Atlantic Road, Railton Road, and Poet’s Corner was the scene of burning police cars and trashed buildings. Some shops were targeted for looting, others left untouched. The statistics indicate genuine disorder: two burned-out pubs, 140 seriously damaged buildings, 300 injured cops, 60 destroyed police vehicles, 80 arrests. In what seems to be another mainstream media scare story, it was widely reported to be the first time Molotov cocktails were used on English soil. In fact, there is evidence of Molotovs being used earlier, for example in the 1958 Notting Hill riots, when West Indian immigrants fought back against racism. Unsurprisingly, right-wing commentators attempted to blame everything on the anarchists. While we cannot confirm this, Meltzer recounts that a pacifist called Jim was arrested, possibly because he shared the same name as a Rastafarian friendly with the 121 who was subsequently nicknamed “Jim the Anarchist.” Things may not have worked out very well for pacifist Jim had he not possessed a cast-iron alibi: on the night he was supposed to have been instigating violence in Brixton, he was playing the violin in a church concert some distance away. The riots were centered around Railton Road and when Brixton was burning we showed our solidarity with the oppressed by joining them on the streets. We even took tables and chairs out onto the street in front of the gay squats for a celebration party—some people in drag—getting a mixed reception from people on the street. Some hostile, others indifferent, some amused. Two of us were sent to prison for a couple of years for supplying petrol to the rioters. The scenes of disorder shocked the nation. A public investigation was launched, the Scarman Report; it declared that the stop and search powers (the hated “sus” law) were indeed being used disproportionately and indiscriminately against black people. It made recommendations intended to produce a new code of behavior, but in 1999 a report on the racist murder of Stephen Lawrence concluded that not all the recommendations had been adopted and that the Met was still institutionally racist. The Brixton riots of 1981. Here we see disparate yet interconnected groups such as anarchists, gays, and West Indian immigrants squatting to create a space where they felt comfortable, and rising together against the police when they tried to regulate the autonomous zone of the Frontline. There were other riots to come in the 1980s, and the Frontline was not the only free space in the UK; but it was the only one to receive such brutal repression. The mid-1970s are said to be the time when the modern UK came closest to revolution. Following those turbulent times, small pockets of autonomy dotted across the country in the early 1980s. They might have grown into English Christianias or Ruigoords had they not been neutered through a mix of repression and assimilation. The generally accepted figure estimated there were 30,000 squatters in London and 50,000 squatters in England altogether. The majority lived in residential houses, alongside renters and home-owners, but others lived together in larger projects. The Alternative Republic of Argyle Street in Norwich housed more than 200 people from 1979 until 1985, when it was evicted and demolished. In Brighton, squatters took on and renovated properties under license in the derelict streets near the seafront. On one road in Bristol, there was a venue (the Demolition Ballroom), a café (the Demolition Diner), and the Full Marx bookshop. Around the same time, Manchester Council was slowly losing control of the huge concrete crescent blocks of Hulme. Punks, musicians, travelers, drop-outs, and artists moved in and provided the underground base for what would become the Madchester scene. Situated close to the legendary Hacienda (home of New Order and Factory Records), the squatters had their own club, the Kitchen, which was formed by smashing together three adjacent flats. The entire complex was evicted and demolished in the mid-1990s. Frestonia, a squatted area in West London, had declared its independence from the UK and was entering its fifth year. The Clash recorded in a rehearsal space at the People’s Hall; the Mutoid Waste Company put on shows in the gallery, and stamps were produced featuring a gorilla’s head instead of the Queen. David Rappaport, later to find fame acting in films such as Time Bandits, was named Foreign Minister; the Minister of Education was a two-year-old girl, and Heathcote Williams was ambassador to the UK. Photo of Frestonia by Tony Sleep. At Tolmers Village in Camden, just north of central London, squatters joined local residents in fighting to save a Georgian square. Eventually, it was demolished, but thanks to the campaign some social housing was built in its stead instead of just offices. Alex and Ciara Smith lived at Tolmers for a year without money, and then found two pound notes in the street, which they used to set up Alara Wholefoods. It began in a squatted dairy and is now a successful organic food company, almost forty years later. In similar fashion, a law firm grew out of the legal aid center. Meanwhile, in Huntley Street, more than a hundred squatters cracked flats and won tenancies from the Greater London Council. All these free zones contained social spaces such as bakeries, cafés, and bars. They produced their own newsletters and organized street festivals. Back down in south London, the derelict Bonnington Square was resettled and revived by squatters, some of whom still live there. Nearby St. Agnes Place was another thriving squatted street, which was finally evicted and demolished in 2005. In Brixton, there were squatted blocks of flats, squatted crèches, and whole food cooperatives. Brixton today is a multicultural place which benefits from this rich history in many ways. One whole food cooperative is still going strong on Atlantic Road. Yet the area is now undergoing a severe gentrification process. While some squats remain, it is hard to imagine what it must have been like on the Frontline in the early 1980s. A few decades ago, Lambeth Council forgot that it owned certain properties; squatters ended up gaining ownership of them through adverse possession, living there for 12 years continuously without the permission of the owner. In 2002, a change in law made this much more difficult. Today, squatters are required to inform owners that they are making a claim for possession; now only incredibly incompetent owners will lose their unused properties. While the stories of squatters gaining houses are heart-warming compared to the heart-rending cases described below, this only occurred in a few cases. The 121, for example, failed to do this. Squats always come and go. But many long-term squats have been evicted recently, such as Rushcroft Road and Clifton Mansions. Clifton could boast members of the Pogues and the Turner Prize-winning artist Jeremy Deller as former occupants. The 22 three-bedroom flats have been renovated and are now for rent at the eye-watering figure of £2,100 per month. To give an idea of how insane this is, the maximum housing benefit (Local Housing Allowance) a person would be able to get in Lambeth nowadays is £340 per week for a three bedroom property, or £1020 per month. Only yuppies will be able to afford to live in Clifton Mansions now. In another unpleasant manoeuver, Lambeth Council is currently repossessing properties that it has long ignored. To take one example, Maritza Tschepp has lived for 33 years in a house in Stockwell, adjacent to Brixton, which was so run-down when she squatted it that it was marked for demolition; she had to dig in a connection to the main water supply herself. She has raised three children in the house and formed a housing cooperative through which she rented it from the council. The settlement appeared to have become permanent; but owing to the surge in property values, in 2009 Lambeth decided to sell off all its so-called shortlife properties. Tschepp has already lost possession in court and now is awaiting an eviction order in 2014. The argument that the house actually belongs to the Council does not hold much weight considering the length of time Tschepp has lived there and the money and energy she has expended upon it. This social housing is being sold off at a massive profit to private companies which will then build homes for the wealthy. Yet the Council appears deaf to her appeals. In another case, Jimmy Rogers, now 74 and the inspirational force behind the Brixton TopCats, one of the UK’s foremost basketball teams, is threatened with eviction. The local Member of Parliament is supporting him in his struggle to avert eviction from his home of 32 years by Lambeth council, which previously gave him a Civic Award. Other places under threat include Carlton Mansions and Rectory Road in nearby Clapham. A “super cooperative” has been formed to represent a united front of opposition, but the Council is unlikely to back down with so much money at stake. In other European cities such as Amsterdam and Copenhagen, squatters have ended up owning their houses, yet this happens rarely in London. The ex-squatters and activists of Berlin, some of whom live cooperatively in “hausprojekten” (large tenement blocks, often legalised squats), should be looking on with interest. Many of those projects are on rolling 10-, 20-, or 30-year contracts and group themselves together under the Wir Bleiben Alle (We All Stay) campaign. While squatting in Berlin is difficult, ever since the 1980s squatters have made a point of responding to evictions with as much property damage as possible. The custom that every eviction should be met with 1 million Deutschmarks worth of damage, now updated to 1 million euro, used to strike some British squatters as more tantrum than tactic, but it appears to work very well. There have been few evictions in recent years; the squats that have been evicted, such as Yorckstrasse and Liebigstrasse, have been fiercely defended, and in the former case, this resulted in a new squatted project, New Yorck im Bethanien. The threat of disorder and economic damage certainly seems have an impact, especially in the case of large well-loved projects such as Koepi and Rote Flora in Hamburg. Demonstration in December 2013 supporting the Rota Flora in Hamburg. If only such militancy and solidarity could help the people being threatened in Lambeth. The problem is that the former squatters are forty years older than they were and in many cases have become disconnected from the current movement, despite the formation of the super cooperative. The endangered squats are all small and individualized. Recent evictions have been resisted, but not ambitiously or successfully; after forty years of residence and long, draining legal battles, it is understandable that people would give up, but this also indicates the low ebb of the current movement. While squatting was threatened, social centers and squatted protests blossomed all over the country, but now things have quieted down. SQUASH (Squatters Action for Secure Housing) continues to fight proposals to extend the criminalization of squatting to all buildings, but most local groups have disappeared off the map. This does not necessarily mean they have ceased to be active, so much as that they have gone underground again. A diffuse and scattered scene may be harder to repress, but we can’t help wondering what would have happened if all the thousands squatting had allied together to oppose criminalization. The war over the public image of squatting has already been lost. As Ian Townson puts it, “Things were not always like this. In the not too distant past, Labour politicians and councillors stood up for social justice and were on the side of ordinary working people, the poor and dispossessed.” Unfortunately, it seems that those who bought their squats or formed housing cooperatives that had good luck in engaging with the system are still around, while more precarious squats are now endangered or else already evicted. Will it even be possible to squat in the future? The precarity of squatting set against the perceived necessity of having long-term spaces from which to organize has recently inspired the establishment of cooperatively owned or rented social centers. These are often based on the constitution of working men’s clubs and continue the self-organized spirit of rented or squatted predecessors such as the autonomy centers of the 1980s. One trailblazer was the 1 in 12 Center in Bradford, which bought its building in 1988. Other centers include Kebele (Bristol, originally squatted then bought with a loan from the Triodos Bank), London Action Resource Centre, Cowley Club (Brighton), Sumac (Nottingham), Freedom (London), 56a (London, the one remaining squat from a squatted estate in Elephant & Castle, now legalised), Autonomous Centre (Edinburgh, Scotland) and the Star and Shadow (Newcastle). These centers are loosely linked through the UK Social Centres Network, which also includes squatted projects such as the Red and Black Umbrella (Cardiff, Wales) and 195 Mare Street (Hackney, London). There have also been many squatted social centers, and the legalized projects often provide infrastructure and support for these more fleeting interventions. London in particular has seen many social centers, though many of these lasted months rather than years. Honorable exceptions include Rampart, Ratstar, the 491 Gallery, the Spike, and the previously mentioned 121. Squatting offered a chance for alternative cultures to thrive without the pressure to pay rent. The anti-globalization movement has utilized squats as convergence spaces, but these antagonistic spaces have often been raided and illegally evicted, as during protests against an arms fair in 2001, the G20 in 2009, and the G8 in 2013. Police raiding the G8 convergence center. In another take on the precarity of public, political squats, some groups have decided to reinterpret the short time frame as a positive feature. The Anarchist Teapot (Brighton), Temporary Autonomous Arts (Brighton, Bristol, Edinburgh, London, Manchester, Sheffield), A-Spire (Leeds), and OK Cafe (Manchester) all opened up for periods of a few weeks at a time. The idea of the short term pop-up social center has been used in London recently for various specific actions including Palestine solidarity, anti-cuts organizing, radical housing activism, and an exhibition about the history of squatting. The latter, Made Possible by Squatting, is hopefully just the beginning of new efforts from within the squatters’ movement to narrate its own multiple histories. The Made Possible by Squatting exhibition. Squatting has also been used as a means to protest about single issues, such as the establishment of unwanted supermarkets. As huge supermarket chains such as Lidl, Aldi, Sainsburys, Tescos, ASDA (owned by Walmart), Morrisons, and the Co-operative seek to remake all high streets in their own image, many prospective sites have been occupied in often unsuccessful attempts to prevent their conversion. Failure to prevent the eventual establishment of a supermarket does not necessarily mean the campaign against it was futile; even occupations that did not achieve their object have slowed the pace of progress, gathering support and making it more difficult to impose future projects from above. In Brighton, there have been frequent interventions against supermarkets. Near the city, the treehouses of the Titnore Woods land squat prevented ancient trees being chopped down. The Harvest Forestry and Sabotaj squats, in 2002 and 2011 respectively, served as short-lived catalysts for long-term anti-Sainsburys campaigns. The Lewes Road Community Garden lasted for a year; when it became known it was being evicted to make way for a Tesco, resistance increased. Although a building was eventually constructed on the site, the shop space under residential flats remained empty and indeed was squatted again in 2013. Unfortunately, this has now become a supermarket (but not at least a Tesco). The Sabotaj squat in Brighton. Rioting occurred two weeks in a row in Stokes Croft, Bristol, when an area that was undergoing gentrification exploded after police raided a squat opposite an about-to-be-opened Tesco store, to look for Molotov cocktails. None were found, but the supermarket site was completely trashed. To our knowledge, there have not yet been large-scale public squats for and by undocumented migrants in the UK along the lines of the occupations in many West European cities, although in London there have been large low-profile squats and also the Occupy spin-offs such as the Hobo Hilton. In Europe, protest squats include the We Are Here project in Amsterdam, the Refugee Strike in Berlin, and the Refugee Protest Camp in Vienna. In Calais and Brussels, there have been large squats for hundreds of migrants. Further south, there are projects like Mount Zion in Barcelona and Metropoliz and Porto Fluviale in Rome. The We Are Here occupation in Amsterdam; photo by hansfoto. As Fortress Europe continues to tighten its security, more people will fall into the cracks and we will likely see “sans papiers” (without papers) squats in the UK. We hope that the scattered and fragmented UK squatting movement will be able to help out. There is already much No Borders work being done, and the recent case of Irina Putilova was inspiring. She is a Russian LGBTQ activist and squatter seeking asylum in the UK who was unexpectedly put into fast track detention at Yarl’s Wood Immigration Removal Centre, then released as a result of public and legal protests. This was inspiring both because she was not deported and because as soon as she was safe, efforts were immediately made to help the other people threatened with deportation who do not have a similar support network around them. There is much more to say about squatting as a social movement. We have focused primarily on the boroughs of Lambeth and Tower Hamlets in London, but there are other boroughs with equally strong squatting heritages, such as Hackney and Southwark. But what will happen next? No one knows how many people are squatting, but the figure is surely still in the thousands. Squatting in residential buildings is now criminalized, but it seems unlikely that the new law will be enforced much, as two court cases have already shown it to be hard to implement. Squatting is defined as living or intending to live in a property without the permission of the owner, but in practice it appears to be difficult for the police to prove that someone is living somewhere without surveillance, forensic analysis, and witness reports. This sort of intelligence gathering would require the police to expend already overstretched resources. An occupation in Southwark protesting the sale of Council housing defied the logic of the law, occupying a building without anyone actually living in it. When recently a similar action was attempted in Camden, two people were arrested. If they end up being charged, this could be an interesting test case. Still another matter, yet to be explored legally, is how exactly a residential building is defined. The criminalization of squatting was ineffective in Spain. In the Netherlands, following a period of uncertainty, squatting now occurs regularly again. 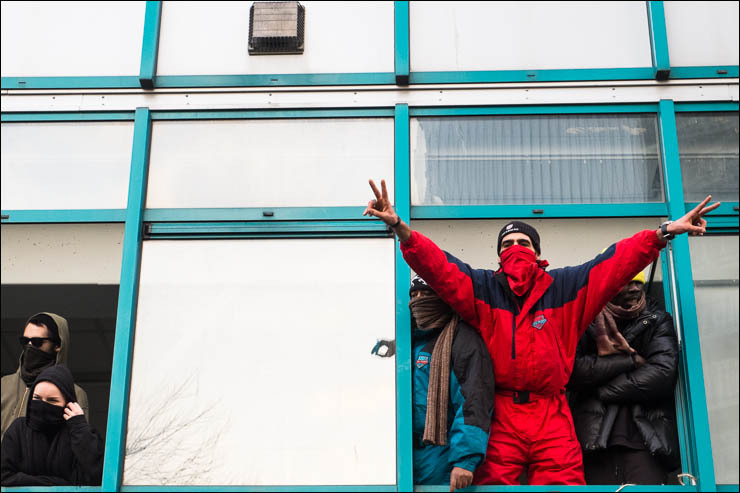 It only really paused in Amsterdam while the new law was challenged in the courts, as is taking place in the UK now; squatting continued in other cities, and squatting actions seem to have resumed in Amsterdam again. The heyday of the squatters movement in the early 1980s now seems quite distant, when in Amsterdam there were over twenty local “kraakspreekuren”—squatters’ advice hours providing assistance on the practicalities of squatting and information on available buildings. Yet three kraakspreekuren are still going strong in Amsterdam: Center/West, Student, and East. In Amsterdam, as in London, it is still possible to squat. The scene has dwindled, but it may begin to grow again. There has been considerable activity around the Valreep social center, which was squatted after criminalization, and also support for refugees with the We Are Here project noted above, which recently squatted offices adjacent to a parking garage. Support for migrants remains a key issue. In the 1990s, the mayor of Amsterdam declared “No culture without subculture,” encouraging a view of squats as providers of cultural activities or “broedplaatsen,” breeding places. This led to a number of squats becoming legalised; some were glad to see squats glean mainstream appreciation for hosting theaters, hacklabs, rehearsal spaces, venues, and cinemas. Yet this policy was divisive: the value of squatter culture was appraised by those in power according to their own interests, rather than by the creators themselves, and some projects were favored over others. Even projects that appeared to fit the “broedplaats” template, such as the Kalenderpanden, were sometimes evicted. Legalization poses further questions around institutionalization and co-optation. In the UK, these questions are rarely raised, since the average life of a squat is three months—the time it takes for an owner to go to court to regain possession. Yet since there are still many groups which can benefit from squatting, it continues. As the housing crisis deepens, we anticipate that more people will turn to squatting. Shelter, a homelessness charity, has warned that “Britain is now at the centre of a perfect storm of housing problems. High and rising rents, the cripplingly high costs of getting on the housing ladder, and the lowest peacetime building figures since the 1920s have all combined with a prolonged economic downturn to increase the pressure on families.” Another commentator ends a long analysis by suggesting that we will soon be witnessing the return of slums in the UK. If the Conservatives carry out their threat to remove housing benefit for the under-25 age group, squatting will become an attractive proposition for the youth of tomorrow in the absence of other housing options. Victims of the bedroom tax may soon squat their own houses. We can only hope that once people have secured housing for themselves they will organize in structures that are antagonistic to the state, which created the housing crisis in the first place. The lesson of history is that in times of housing deprivation, people squat the empties. The fact that this has been made illegal does not blind people to the empty buildings or to the use of squatting as a tactic. The kraakspreekuur in Amsterdam East promotes the slogan “Wat niet mag kan nog steeds”: what is not allowed is still possible. The criminalization of squatting in England can be seen as a pre-emptive attack on direct action for housing justice. But if enough people disregard the new law, or indeed occupy the many non-residential buildings that stand empty and unused, this could produce a new population that understands itself as being in open conflict with the state. Who can predict the diverse autonomous movements to come? Tower Hamlets is a London borough formed in 1965 from the amalgamation of Bethnal Green, Stepney and Poplar. It is unfortunate to record that Fitzpatrick was convicted in 2011 of racially aggravated harassment against Lee Jasper. My mention of his work in the 1970s here does not condone in any way his actions some forty years later.